Content marketing is a great way to attract clients and customers – whether you’re a small business owner, freelancer, or both. In fact, 57% of marketers now report that content marketing is their top marketing priority! But, for those of us who seem to have a never-ending (and always growing) task list, content marketing might keep getting pushed to the bottom. Especially considering the time and energy it takes to publish valuable content that will stand out among all the other content online. We can turn to “repurposing content” to get the most out of every word we write. Repurposing content should not be confused with “revamping” content or “updating it so it remains relevant and attractive to that audience,” (also from Hubspot.com). An example of repurposing content (by changing the format) would be to turn your e-book into a series of blog posts or to use an article as a video outline or script. The basic idea is the same, but the content may be reworded or restructured for the new audience. 1. You’ll reach more potential customers. Some people prefer to read while others prefer to listen. Some people prefer handouts to absorb a new skill while others prefer to read a step-by-step outline with examples. By repurposing content in different formats you’ll reach the people who might not read a blog post, but would listen to a podcast that reads it to them. Additionally, graphics – such as memes or infographics – get shared more often. If you turn a lengthy article into bite-sized graphical pieces, you’ll have more opportunities to get your message shared via more channels. 2. Repurposing content will boost your SEO. By repurposing content, you’ll create more occasions to use the same keywords. This will increase your search engine rank for those keywords and make you more of an authority on the subject. For instance, if you write an article called, “7 Tips for Writing Effective Short Copy,” you could turn that into seven different pieces of content on “writing effective short copy.” This would give you seven additional opportunities to rank for the same keywords and be seen as an expert on writing effective short copy. 3. You’ll save time, energy, and other resources. By repurposing content, you’ll stretch your ideas and opinions further. This way, you won’t have to come up with so much epic content. In other words, if you aim to write several 1,000-word articles every week, you’re bound to run out of ideas, experience burnout, or even tire of your message. Instead, try repurposing content so you get more value from each piece. Like mentioned above, you could use one 1,000-word article to create seven different pieces of content … or 70 different pieces – depending on how you break it up and repurpose it. Repurposing content also has the added benefit of giving you back more time to focus on promoting your content – rather than cranking out new stuff that you barely have time to share. You could write something today with the intent to use it for repurposing, but a better use of your time is likely repurposing content you already wrote. Look through your current content for the pieces that resulted in the greatest traction – as in social shares, comments, and traffic. If these pieces were popular once, other versions of them are likely to be popular too (assuming the content is still accurate and relevant). Keep in mind that repurposing content isn’t just saving you time and effort. It’s also about spreading your content (and ideas) to different mediums in order to attract clients and customers from diverse sources. 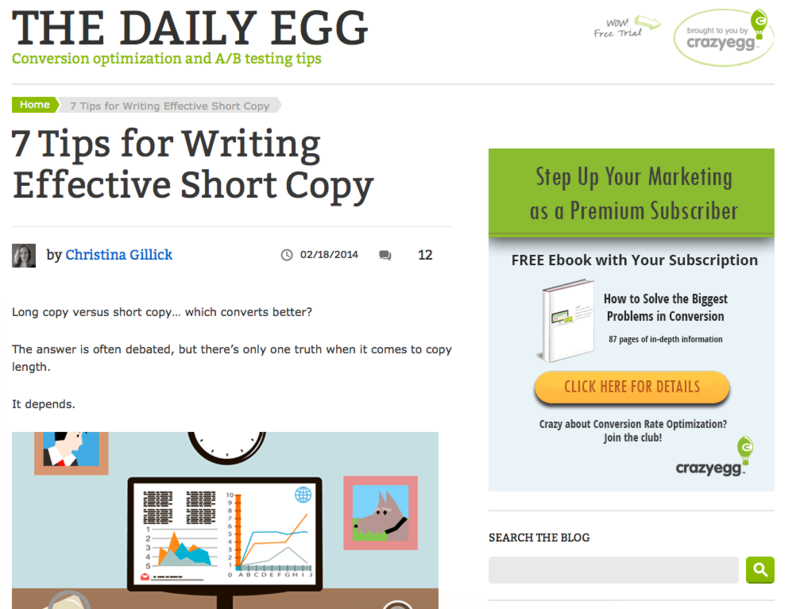 I originally wrote this example article for the CrazyEgg blog (known as The Daily Egg). I was happy with the response it received – both in terms of social reach and prospective clients who contacted me about potential projects. Also, the topic is in line with my message as a freelancer and my target market’s desire. 1. Compile a list post. Although our sample article is already a list post because it gives “7 tips,” you can also turn a series of posts into a list post. For instance, if you regularly write about website design, you might create a post called, “7 Things You Might Now Know About Web Design.” Then you could give a brief summary of each article (as one of the 7 things) and even link to the longer versions. 2. Make a video or slideshow. Video is a popular way to reach a lot of potential customers. Plus, with today’s technology – like Animoto.com, it can be fairly simple to create a video – especially if you already have the content. You could also use a webcam to record yourself explaining your content. This way – because your viewers can see you – you’ll build more rapport and likely get more attention. Other option is to create a slideshow. You could use PowerPoint to put together one or two slides for each of your points. Then, you could narrate the slideshow by explaining each point. When you’re done, you could upload it to a service like SlideShare.net. Infographics naturally get shared often – spreading your message and name further than one piece of content alone. Plus, because infographics are simple, they’re easy to make and quick for your audience to absorb. Also, check out DailyInfographic.com for ideas and inspiration. 4. Cut your content into pieces. If your content is lengthy, detailed, or in the form of a list, you can break it into many articles. For instance, a “complete guide” could be broken into sections and repurposed as new posts. The article I used as an example above could be cut into 7 different articles – each one featuring a way to write effective short copy. Once you cut your article into multiple pieces, don’t forget to share each piece separately to reach more people. You might also consider adding an image, graphic, or example to each one to make it more visual for social media channels like Pinterest. 5. Make (and send) an e-letter. An e-letter is basically a newsletter that is sent out to your contacts via email. It’s a great way to keep your name – and business – at the top of their list. This way, when it comes time to hire someone, they are more likely to think of you! The problem, however, is that creating valuable content for an e-newsletter can be time-consuming. That’s why repurposing content for your e-letter is ideal. Take your best content (like we discussed earlier) and re-format it into an e-letter. You’ll basically want an email with 3-4 bite-sized chunks of 250-600 words each. Then, you can use a service like MailChimp to send your e-letter to past and potential clients. 6. Compile your content into an e-book, PDF report, or free guide. If you have a lot of content on one subject (or similar subjects), you could compile it to make an e-book or giveaway (also known as a bait piece). E-books can then be sold via your website – creating another revenue stream for you. Or, you could use the piece to generate leads from your website visitors. Learn more about lead generation with e-books here. Once you repurpose your content, you’ll want to get the most out of it by continuing to promote it. Any of the above options can be used to change the format of your content. But, don’t forget that another option is to repurpose the content by changing the target audience. Combine that with the six ideas above and you’ll have a near constant supply of repurposed content … assuming you’re starting with at least one article of your own. If you need help writing your first article, check out this link. 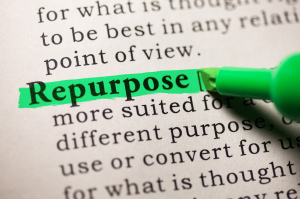 Do you repurpose content using any of the above methods? Did I leave anything out? Please share in the comments below! Next Is It Better to Be Average?